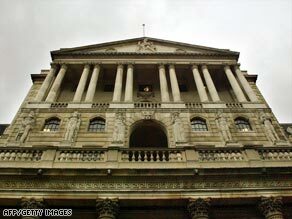 The Bank of England Thursday cut a key interest rate from 1 percent to 0.5 percent, a new record low. The reduction in the official bank rate was expected. The bank, which is Britain’s central bank, has been reducing rates steadily since October, when the rate was 5 percent. The 315-year old bank’s previous rate cut was in early February, when it cut the rate from 1.5 percent to 1 percent. In addition to the rate cut, the bank announced it would pump £75 billion ($105 billion) into the economy. Known as “quantitative easing,” the move is meant to encourage banks to lend funds again to each other as well as to individuals and businesses. Despite interest rate cuts, most banks have not passed the savings on to their customers. The Bank of England wants to encourage them to do so.